We thought it would be great to go through the history of the iOS design, from iOS 1 to the most recent iOS 8. Throughout the years Apple has brought us everything from Copy Paste, to Siri and the App Store. The GIF below shows the different changes the iOS design has gone through. When the original iPhone was unveiled, Steve Jobs described the software as a mixture between OS X and Smartphone OS. 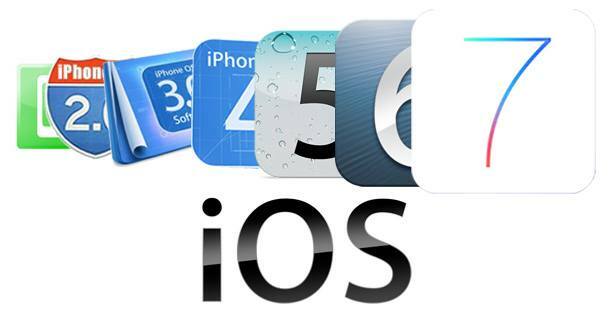 In the beginning iOS was referred to as iPhone OS, however, with the release of iOS 5 this changed and the Operating Software would become known simply as iOS. Even though the original iPhone and iOS were revolutionary in many ways, it cae with just as many limitations. With iOS 2 Apple finally introduced third party apps, and the App Store was born. Released in 2008, the App Store finally gave users access to thousands of apps created by developers. The App Store really helped catapult Apple ahead of competitors, quickly everyone as talking about apps. Everyone and their mother seemed to be releasing apps. Furthermore in order to make space for all the new apps, Apple introduced pages, which meant instead of being confined to a single screen your apps could take up several pages. In this version Apple also introduced the ability to take screenshots. iOS 3 brought with it perhaps one of the most requested features, Cut and Paste! 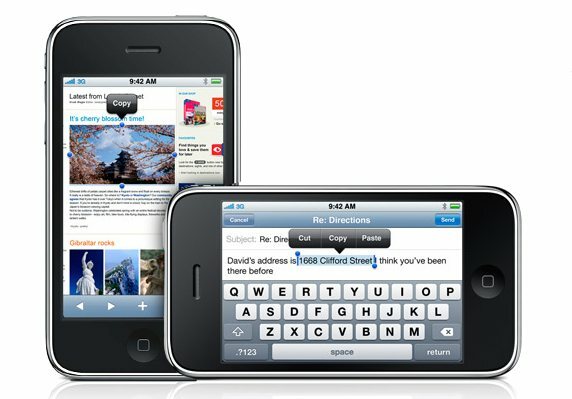 Until iOS 3 it was impossible to cut and paste text on the iPhone, meaning if you wanted to copy text from one app into another it was not possible. Another greatly needed feature that was introduced in iOS 3 was the spotlight search, which allowed users to complete a system-wide search. This worked in all Apple apps such as contacts, emails, calendars, notes, and the iPod. iOS 4 added some much needed features for power users, perhaps the biggest feature was Multitasking, while this still didn’t allow users to have more than one app open at the same time, it does allow users to complete certain tasks in the background. Furthermore iOS 5 came with support for the iPhone 4’s stunning Retina Display. Finally iOS 4 allowed users to install custom wallpapers on their devices. iOS 5 was released at the same time as the iPhone 4S and introduced the world to Siri, who replaces Voice Control with a virtual assistant who can do everything from telling you to remember an umbrella to reading your latest texts back to you. Need to find the latest NFL scores, simply ask Siri and your wish is her command. The only problem with Siri? She doesn’t run on older devices, so if you wanted to join the party you would have to pony up for a new phone. In iOS 6 Apple kicked out Google and brought in their own Maps app with their own turn-by-turn voice navigation, and a new flyover feature. However, as you might remember Apple Maps failed miserably and people looked for Google to get them to their destination safely. Apple also introduced several other features such as Do Not Disturb mode, panorama photos, as well as Facebook integration. After the Maps debacle, Scott Forstall decided to leave Apple, and the UI design reins were handed over to Jony Ive, which ultimately resulted in the biggest redesign of iOS since the launch in 2007. Ive did away with many of the skeuomorphic UI elements in favor of a much flat design with colorful gradients. Furthermore iOS 7 introduced features such as Airdrop, iTunes Radio, as well as FaceTime audio. 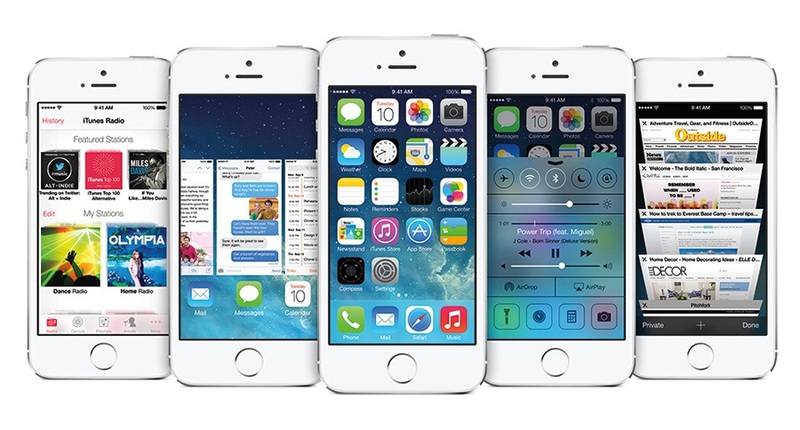 While iOS 7 was all about visual changes, iOS 8 is more about what’s under the hood. This time Apple has focused on expanding features, as well as improving how we work on projects across devices. Thanks to “Continuity” iOS 8 will work together with the new Mac OS X 10.10 Yosemite to bring a brand new form of interaction between iPhone, iPad and Mac. Users will now be able to start working on a project on one device and continue on another. Furthermore, thanks to AirDrop you will be able to transfer transfer images and other files from your phone to your computer. The post A history of iOS design from iOS 1 to iOS 8 appeared first on Design Reviver – Web Design Blog. Earlier this week Apple announced on its developer site that from now on the images submitted along with apps will be locked down once they are approved for the App Store. The reasoning behind this being that currently there are too many scammers submitting apps with basic images for approval to Apple, then switching them out to infringing images that look just like the popular apps. In St. Petersburg, Russia, a giant iPhone was unveiled as a tribute to former Apple CEO Steve Jobs, who passed away in October 2011. The six-foot-tall sculpture, which resembles a black iPhone 4, was brought to life by designer Gleb Tarasov. While the sculpture doesn’t actually work as an iPhone, it does display a photo and video slideshow of Jobs’ life, including important events and well-known speeches. It seems as if it was only yesterday that Apple released their first public Safari beta, when in reality it was exactly 10 years ago. The app was designed by Apple to replace Microsoft Internet Explorer, which was the default Mac browser up to OS X 10.2. Steve Jobs introduced Safari at Macworld San Francisco on January 7, 2003, announcing that Apple based the browser on the company’s internal fork of the KHTML rendering engine — Webkit. The first official version was released on June 23, 2003. Safari’s little brother for iOS made its debut in 2007 along with the iPhone. There used to be a time where Windows Mobile and RIM’s BlackBerry dominated the smartphone market, fast forward to 2011 however and Windows Mobile’s share has dropped to a mere 3% and RIM currently only hold 10% of the market share, so what happened? Simple, throughout the past few years Android and iOS handsets have taken over the market, currently the who giants hold a combined 82% of the market. BlackBerry devices comprised half of all smartphone sales in Q2 2006, but have since seen a steep decline, ending the third quarter of 2011 with just 8 percent market share. While Nokia remains the top handset vendor in the world, it has suffered a major blow in smartphone sales during the transition from Symbian to Windows Phone, seeing a decline from a 33 percent share in 2010 to 14 percent in 2011. During the three months ending in September, Apple held its title as America’s top smartphone maker with a 28.3 percent share followed by HTC and RIM with 20.3 percent and 17.8 percent, respectively, according to Nielsen. 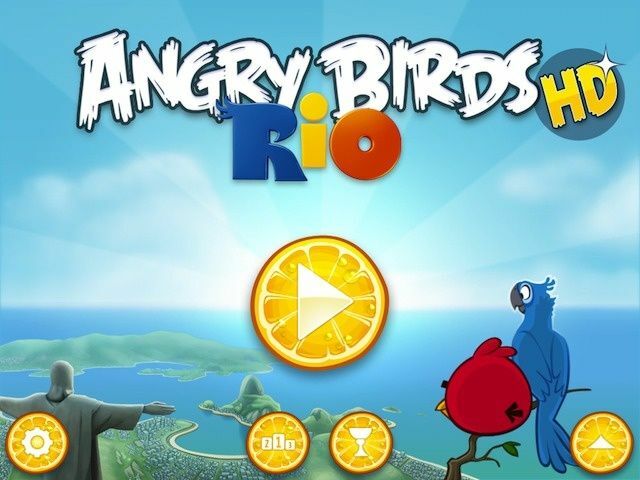 Android phones as a whole dominated the market, however, garnering a 42.8 percent share. If you would like to read the whole press release it can be found here. What do you think, will Nokia and RIM be able to regain their market share? If you have an Apple Developer Account then now is the time to hit the software update button! Earlier today Apple released iOS 5.1 Beta 2 to the developers. We know a lot of people have been waiting for Apple to add the download feature, how about you do you think Photo Stream has lacked this feature? If you are the type that likes a 10″ display for driving navigation, TomTom just updated its $59.99 iOS turn by turn navigation app to be universal and optimized for the iPad. You’ll of course want to have a 3G version of the iPad/iPad 2 or be tethered through an iPhone that can share GPS. iPHONE 3G USERS: THIS IS THE LAST VERSION OF THE TOMTOM APP FOR iPHONE THAT WILL FULLY SUPPORT YOUR DEVICE. You will be able to download and use the next version of the TomTom App but new features will not be available to you. – OPTIMIZED FOR iPAD: Make the most of your iPad, with a full-screen display that shows you driving view and Advanced Lane Guidance images at the same time. Purchase connected services in-App or easily transfer your existing subscriptions (cellular connection required). When you want to go bigger, move your TomTom App to iPad. – LATEST, UPDATED TOMTOM MAP: Because roads are constantly changing, on average 15% of roads change every year, your TomTom App update comes with the latest and most up-to-date map. – IMPROVED INTERFACE: Your TomTom App is quicker and easier to use than ever. See driving view with one touch from anywhere, access guidance options in a tap, and switch between different route types more easily. It’s a simpler way to enjoy TomTom navigation on your iPhone or iPad. Apple announces new iPod Nano! Today was not only the unveiling of the new iPhone, Apple also took their time to introduce an update version of the iPod Nano. Although the same form factor, Apple’s changed the interface to be easier to navigate, mostly by making each icon take up the entire screen: you swipe between them. The fitness experience has been improved. Out of the box, you can now track your walks and runs without adding any extra sensors or devices. Just go for a run, come back, plug it in, and your data will automatically be tracked on Nike+’s website. Also? New clock faces have been added for people who want to use the Nano as a watch. “Why not do it right?” There’s a Mickey Mouse watch, an LED watch, and more. The iPod nano will come in seven colors. 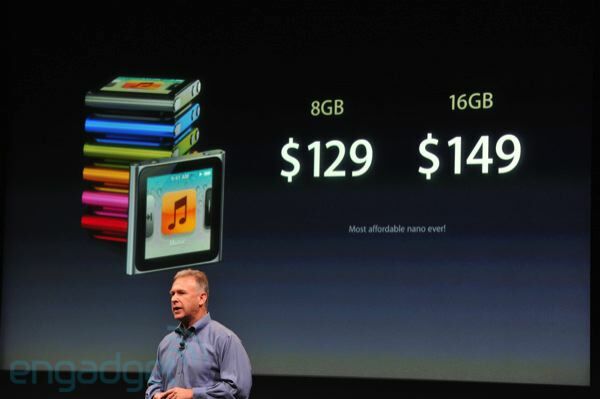 Prices start at $129 for 8GB and $149 for 16GB. The nano is available to buy now.